Freelance Graphic Designer and Half-Pint friend and volunteer Christina Kind refreshed our logo - Check out her other amazing work at Christina-works.com. You’ve waited patiently (for that we thank you!) and now the time has come. The sun today is telling me it’s the day – spring is officially on it’s way. And it’s good that we’re moving to a bigger space, because we now will feature items for children ages 0 to TWELVE! Yep, we’re letting our Full-Pints in on the thrifty action. Bigger Clothes, more sporting gear, gaming, and toys for the older set. ?!Where?! did you say the sale will be located? It’s just a hop away, located technically in McFarland, but near the corner of Hwy 51 and the Beltline Highway, we’re positive that no matter where you live, you’ll find it accessible. We KNOW you’ll love the parking and all of the extra space that is allowing us to expand the sale, as well as give you places to relax with your Half-Pint shopping buddies post sale and enjoy a snack or two before your return to your work and families. More fun mappage to come in the next few weeks! 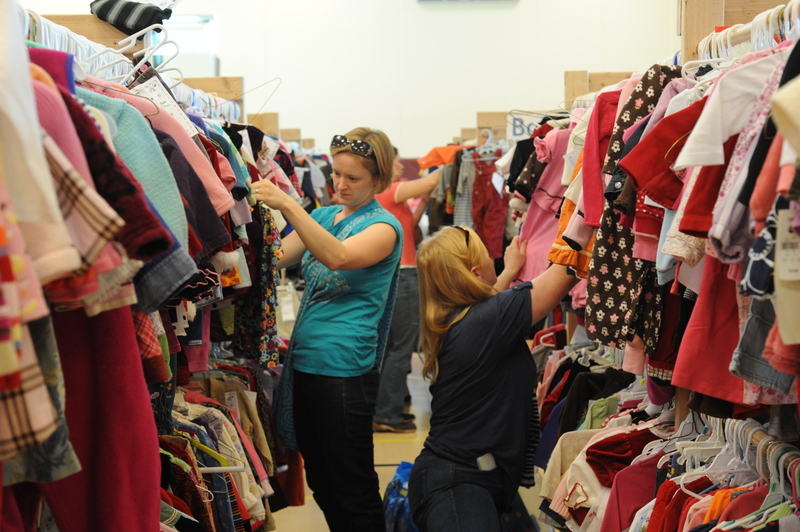 Half-Pint Resale is the area’s largest children’s consignment sale. Last sale we sold nearly 25,000 items in just two days, putting your goods back out into the community and a few extra dollars into local pockets. We love that everything stays right here in our community – we’re an Entirely Local operation. In fact, because of our commitment to the community, we just joined Dane Buy Local and hope to introduce you to other great local and community centered businesses through this new connection. Let’s get the sale on your calendar! Click here for all of the ins and outs and times and details. You’ll note some major changes to the calendar. Longer volunteer and consignor presales, as well as a FULL DAY OF SATURDAY PUBLIC SALE SHOPPING that extends late into the evening (We’re biased, but 9pm is also a great time to grab the girlfriends and head out for a drink afterwards; we’re just sayin’.) You can find even more good deals running into Sunday during the longer Half-Price sale. For those of you shop our presales, we highly recommend taking a second look at the sale post the presales because there are things you’ll never see until they are unearthed! For Veteran consignors, you will find some new – and maybe a bit scary – guidelines. Don’t Fret, we’ve updated all of our tagging guidelines to walk you through the (very simple) process!! Once you are registered through our new online system (more info below), you be able to print out barcodes that correspond with your name and prices (For example, a page of barcodes that are for $2 items, a half page of $5 items, and a handful of $50 items for your gear – and all will be linked to your consignor number. Each $2 barcode is the same, each $5 barcode is the same, etc.). Barcodes are then copied easily onto labels. Labels are affixed to our new tags (that are quite similar to the old tags), giving you the flexibility to tag with a glass of wine in front of the TV or with a gaggle of friends (you can see where our priorities continue to lie, hey?). Already tagged some for this sale? We’ll allow our old tags for this sale only (please only use them if needed) – the barcodes can be affixed to the bottom of the tags, no problem. Wondering why we made the switch? Head over to our Tagging and Pricing area of the site for more info. For those of you who are new, check out the Consigning area of our website for loads of info that will explain how it all works, and learn about all of the fabulous perks of consigning (including 70% of your sales, and a special pre-sale all for you!). Make sure you look through the Tagging Guidelines and our What to Sell documents on this same page. You’ll also note that we are no longer accepting Cribs. Lots more to come in the upcoming days – volunteer registration, Printable Posters, fun contests and ways to get your pre-Half-Pint fix! If you aren’t yet registered for our email list, now is the time to get on board. We’re excited to see y’all again!